My crew loves risotto. It's so rich, so we usually only have it a few times a year. 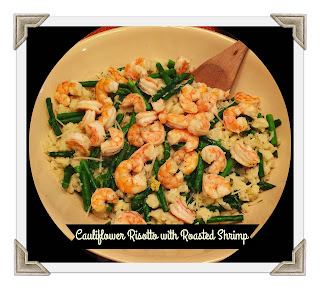 I have been subbing cauliflower for rice in many recipes and thought maybe I could do it with the risotto. I found this recipe online and made a few tweaks. It was a hit in our house! 1. Rice or chop your cauliflower. I found this tip online a while ago and it has helped me. Wrap your head of cauliflower in a kitchen towel and hit it on the counter a few times. It helps to break it up and make it easier to chop or put in the food processor. I remove some of the large stems. Not sure about you,but when I try to chop a cauliflower it's pretty disastrous. There are little white pieces everywhere! This method has helped me. 2. Heat the oil in a high sided pan and add the onion. Season with salt & pepper. 3. Cook until softened (4-5 mins) and then add the cauliflower. Season with salt & pepper. 4. Cook 2-3 minutes and add the garlic and 1/4 cup of stock, stirring until liquid is evaporated. 5. Add the remaining 1/2 cup of stock and the cream.Bring to a simmer. Cook about 8-10 minutes or until the cauliflower is softened. 6. During step 5, roast your shrimp at 425 degrees for 6-8 minutes and steam the asparagus. 7. Once cauliflower is softened, remove from heat and add the parmesan, zest, juice,and salt & pepper to taste. 8. Add the asparagus to the cauliflower mixture and toss. Transfer to a serving dish and top with the roasted shrimp and a sprinkle of the cheese. 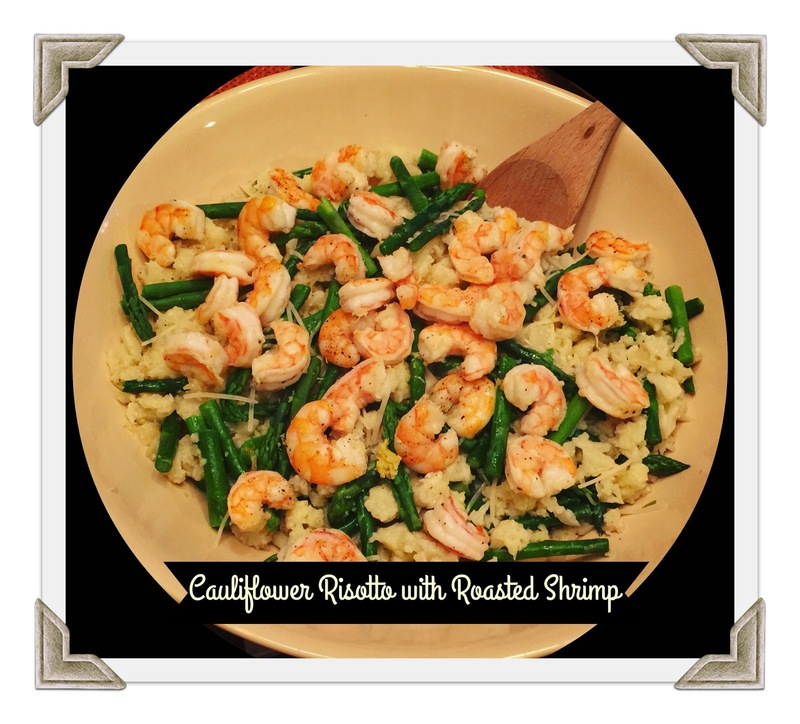 It's a very versatile dish... you could use just the risotto as a side or toss with steamed broccoli. I hope you enjoy it as much as we did! Christmas Day Wrap Up & Sharing a dinner recipe! Pasta with Peas & Ham....made a little lighter! Weekend Wrap Up.......Here's to 39! Friday Favorites- Gingerbread Party Details! Friday Favorites- It's Gingerbread Weekend! Weeked Wrap Up- Hello December Edition! Stay on track this holiday season!